Short-Tailed Albatross on Midway Atoll. Photo courtesy USFWS Pacific. An important – and hopeful – milestone in the conservation of the endangered short-tailed albatross was recorded at Midway Atoll National Wildlife Refuge in November. On Nov. 16, refuge staff observed an adult short-tailed albatross incubating a freshly laid egg on Eastern Island, one of three small flat coral islands that comprise Midway Atoll National Wildlife Refuge about 1,200 miles northwest of Honolulu. Since then, refuge staff have observed the male and female trading off incubation duties. The adult male was banded as a fledgling in 1987 on Torishima Island, a Japanese possession. The female was banded as a fledgling in 2003, also on Torishima. If the pair’s breeding effort is successful at Midway Atoll Refuge, it would mark the first confirmed hatching of a short-tailed albatross outside of Japan in modern history. 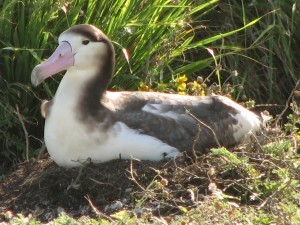 Establishing a new nesting colony is one of several important steps needed to continue the rare bird’s recovery because volcanic activity regularly threatens the short-tailed albatross’ main nesting grounds on Torishima. The species’ recovery also depends on reducing the threats of contaminants, especially oil contamination at sea and plastic ingestion; reducing bycatch of these seabirds from commercial fisheries; and addressing invasive species and other competitive species at nesting colonies. The pair first “met” at Midway Atoll Refuge during the breeding season four years ago (2007-08). That season, they were observed spending only a little time together. During the second season (2008-09), their time together increased. By the third season (2009-10), they arrived at the Eastern Island breeding colony together in October and built a nest. Now, in their fourth breeding season (2010-2011), they appear to have copulated and laid an egg. The short-tailed albatross, listed as endangered since 1970, is the largest seabird in the North Pacific with a wing span of seven to 7.5 feet. It is known for the golden, yellow cast on its head and nape; for its large, pink bill with blue tip and black border around the base; and for its pale bluish feet and legs. Its life span is 12 to 45 years. Pairs begin breeding at about seven or eight years of age, and mate for life. Once thought to be the most abundant albatross species in the North Pacific with a population of more than 5 million adults, short-tailed albatross were hunted for feathers, and harmed in other ways, to near extinction. albatross’ main breeding grounds on Torishima were buried under 30 to 90 feet of lava after a volcanic eruption. Population numbers plummeted to 10 nesting pairs. Since then, conservation efforts have helped increase the population to approximately 2,400 birds, which forage widely across the temperate/subarctic North Pacific and can be seen in the Gulf of Alaska, along the Aleutian Islands and in the Bering Sea. Midway Atoll National Wildlife Refuge has actively planned to host a nesting colony for more than a decade, and this conservation effort seems to be paying off. Short-tailed albatross were rarely seen on Midway Atoll before the effort began. This season marks the pair’s first known mating and nesting attempt. Refuge staff and volunteers will continue to monitor the nest daily with the use of a remote video camera.